Both coders and system administrators encounter many cases where text files need to be compared. Every *nix system for the last few decades has included some type of plain-text diff tool, but this is often not enough. The human brain just doesn’t have the capability/capacity to merge the differences between two files. My grandfather taught me a very important lesson about manual labor: you let the tool do the work. The same lesson can be applied to other fields. Our brains are trained to quickly pick up on visual cues. I work much more efficiently with a utility that displays differences visually. I use Gentoo Linux, so I frequently have to update config files in /etc when packages release new versions. There are built-in utilities to assist in comparing and updating configuration files, but the inefficient workflow frustrated me. A text-only, commandline comparison just isn’t intuitive. +# Based upon the NCSA server configuration files originally by Rob McCool. -# See  for detailed information. -# for a discussion of each configuration directive. -# consult the online docs. You have been warned. +# consult the online docs. You have been warned. +#     whole (the 'global environment'). +#     which responds to requests that aren't handled by a virtual host. +#     of all virtual hosts. +#     same Apache server process. -# with "/", the value of ServerRoot is prepended -- so "var/log/apache2/foo_log"
+# with "/", the value of ServerRoot is prepended -- so "logs/foo.log"
Sure, you can make sense of this, but it’s difficult. And these aren’t even serious changes – just some updates to the comments at the top of the file. What’s more, you have to know the syntax of diff to understand the output. Why suffer when there are tools that are simple enough for a layperson to understand? If you use tools that make the problem simpler, you’ll make fewer mistakes and finish more quickly. My favorite diff tool is Meld. 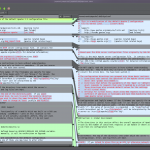 The color-coded visual interface greatly simplifies the task of merging files. The files are shown side-by-side with related lines connected to each other. In addition to breaking the differences down by line, Meld highlights the differences character-by-character. Meld is a visual diff and merge tool. You can compare two or three files and edit them in place (diffs update dynamically). You can compare two or three folders and launch file comparisons. You can browse and view a working copy from popular version control systems such such as CVS, Subversion, Bazaar-ng and Mercurial. Click an arrow to bring the changes from one file to the other. Hold CTRL and click to insert the changed line above or below the new line. Hold SHIFT and click to remove a group of changed lines. You can also treat either side of the window as a standard text editor and make whatever changes you desire. Right click on either of the editor panes to pull up the menu for that file and save your changes.